The communication between mothers and their babies is really powerful. By simply reading facial expressions and body language, we are able to decipher what they are saying and help meet their every need. With baby sign language, we can take our communication even further. By teaching your child some simple manual signs and gestures, they can easily communicate their specific needs, wants, and emotions before their language skills are fully developed. Here is how baby sign language can help you foster better communication between you and your infant or toddler. Baby sign language is very similar to American Sign Language (ASL), but is designed specifically for the capabilities of infants. Mothers teach their babies simple signing through repetition and encouragement. These signs are taught alongside the spoken word, so that children can recognize them better as they grow. Each sign represents an object, feeling, or action. Since children develop language comprehension and motor skills, before spoken language, these simple gestures can help them communicate a full range of expressions. Studies have shown that children who start by gesture have an easier time learning language as they get older. Babies can start learning baby sign language as young as six months old. 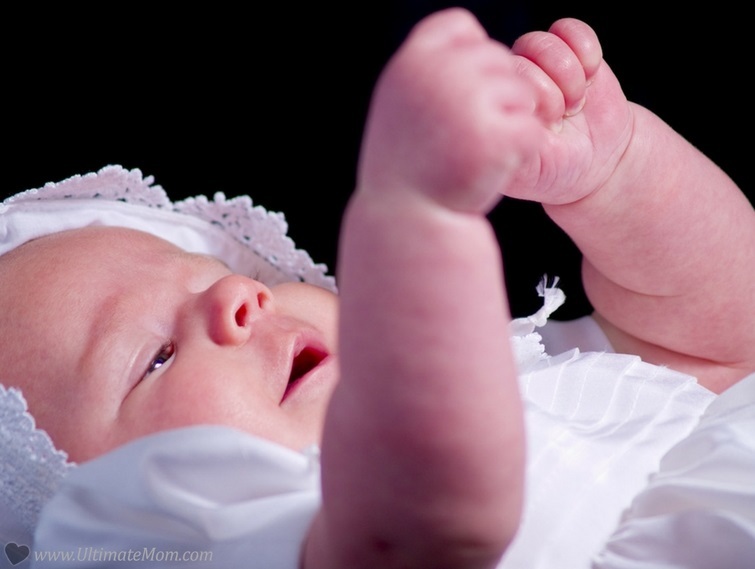 Baby sign language uses a series of symbolic gestures. There is not sentence structure to learn, just basic symbols of words. Baby sign language does not require fine motor skills to master, the gestures are instead very basic and are done using the gross motor skills babies have already developed. You can teach you baby sign language as you go through your normal routine by signing the gesture and saying the word out loud. Repeatedly doing this will teach your child what each sign means and how to do them themselves so they can begin communicating directly with you. As your child grows you can teach them more and more signs until they start talking. Baby sign language can also help your child during their language development years by filling the gaps of knowledge when your child doesn’t know the word for something. Even the most seasoned mother can run into situations where they do not understand what their baby needs. Baby sign language helps reduce the communication barrier between infants and toddlers and their mothers, which can in turn reduce the stress mothers experience when they don’t know what their child needs. A study conducted by the ASL University has shown this can also save a lot of the frustration from a misunderstanding when there is a miscommunication. Another 5-year study of baby sign language also showed that baby sign language that mothers felt more emotionally connected with their children and more confident about their parenting skills after teaching their infants baby sign language. Baby sign language also reduces the stress infants and toddlers feel when they are unable to communicate. This leads to less fussiness, crying, and temper tantrums. Researchers have also shown that since baby sign language also acts as a communication bridge. So infants and toddlers get less frustrated when they are too upset to speak clearly. Reducing your child’s stress can make them happier so there are less incidents of temper tantrums. The biggest benefit to teaching baby sign language is that it fosters and encourages brain development. A comprehensive study on baby sign language showed that teaching your infant baby sign language can improve their language IQ by 12 points. This study followed infants who were taught baby sign language until they were 8 years old. They found that at every stage, all the children who were taught baby sign language were in the top 25% of language development among their peers. Another research study showed that using baby sign language helped baby’s’ cognitive development of both their visual and auditory learning. Though most of these studies are conducted within small test groups, the findings have been very significant and have inspired more research on the benefits of baby sign language. Learning baby sign language is a great activity to do together. Educational experiences are a great way to connect, especially when you are learning something together. Signing is very fun because you not only get to have some basic conversations with your infant and toddler, you can also learn signs that represent fun things like laughter, playtime, and even animals and toys. Baby sign can add a lot of humor to your quality time. Plus, helps you bond with one another and creates a stronger understanding of each other’s personality which can be a fun discovery time. Baby sign language is based on ASL, so it helps them learn and develop the signing skills that are crucial to communicating with other hearing impaired children. It will also encourage them to learn more signs as they grow and develop ASL fluency. This will help your children connect and foster friendships with deaf or mute children. You too will also develop these skills as you teach your children how to sign, opening up a world of social and educational possibilities for both of you. Once your infant is around 6 months old you can begin incorporating baby sign into your daily routine. Start by determining what signs are most important to you and your baby’s lifestyle and begin working them in as you go through your day. As your child learns to both do the signs and respond to them, encourage them with love and praise. Make sure whenever you do the sign you also say the word so your child learns the meaning of the spoken word as well as the gesture. If you are interested in learning baby sign, we’ve compiled a list 16 of the most important words to start off with. These words can help you begin bridging the communication gap and help your child communicate their most basic needs. We’ve also included links to the instructions on how to do the signs so that you can learn them right away. Hungry: helps you and your baby communicate when it is time to eat. Thirsty: helps you and your baby communicate when they’d like their bottle or sippy cup. Tired: helps you communicate when it’s bed or nap time. Bath: lets your baby know it’s time to take a bath. You can also use it for when it’s time to wash up. Play: helps you communicate when it’s playtime. Your baby can also use it to ask if they can play with something. Car: helps you communicate you are going to go on a car ride somewhere. Hot: helps you communicate when the food or the bottle is too hot for baby to eat. More: helps you baby ask for more or something and lets you ask your baby if they would like more of something. Again: works to both help ask your child if they want to do something again and tell them something is going to happen again. It also lets your baby ask if they can do something again. All Done: lets you baby communicate when they are done with something. This can also help you communicate when the activity is finished or there is no more of something. Help: lets your children as you for help, but can also let you ask if they need help with something or want to try it by themselves first. Where: lets you or your baby ask where something is. It can also be used to help either of you find something. Happy: can help your baby communicate when they’re happy and helps you ask them if they are happy. Sad: helps your baby communicate when something is making them sad and helps you understand why they are sad. Scared: can help babies communicate when they find something scary so you can figure out ways to help them overcome their fears. Angry: helps your baby communicate when and why they are mad, rather than throwing a temper tantrum. BabySignLanguage. com: BabySignLanguage.com is the ultimate resource for learning about baby sign language. They have a ton of research on the benefits of baby sign language and offer free tools and resources such as video tutorials, printable flashcards, and a dictionary of signs. If you really want to delve into baby sign language, BabySignLanguage.com also offers learning packages that include easy-to-follow wall charts, books and DVDs to help your infant or toddler learn and practice the signs, and a helpful teaching guide for you. My Smart Hands: Most of the resources on My Smart Hands like classes, books, and flashcards are offered for a fee. However they have a free comprehensive signing dictionary that can be very useful when you are looking to expand your baby sign vocabulary. Sign Saavy: Sign Saavy is actually a free resource for learning ASL. However, they also have a free comprehensive dictionary for learning and teaching baby signs. They also offer free flashcards, quizzes, and a printable word list to help you master all the signs. Baby Sign: Baby Sign is a free app offered for iOS that contains video demonstrations of different baby signs. If you are an Android user there is also a comparable baby sign app can Baby Sign and Learn for free. Baby sign language is a great way to start communicating with your baby. With some basic gestures you can help meet all their physical and emotional needs easier. Baby sign language is easy to learn, has a ton of amazing developmental benefits, and can set them up for success later in life. 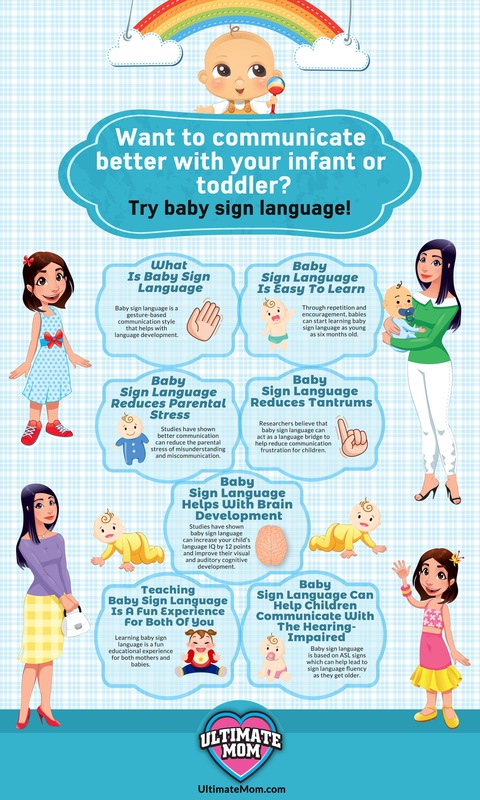 So try some of these signs and check out the resources we provided so you can get started communicating with your baby today!